Wet Spring But a Strong Backlog! With Spring officially here and the season having started for most of you out there, we've definitely seen some delays because of decent amount of April showers! From our discussions with clients all over North America it sounds like it's been a wet spring everywhere with lots of work already booked! Great news for the whole industry! We have been very busy working on finalizing the complete rewrite of our QuickBooks integration with Manage360. We have started work on our time tracking mobile app! I know! Very exciting! And we have been very busy with improving the performance of DS|Design and DS|Color! How is your Spring shaping up? Has the wet weather kept you down? Do you have a healthy backlog? What would make your busiest time of the year easier for you? We really would like to know. Feel free to reply to this email! This past winter, the great team at Rosehill Gardens in Kansas City, MO implemented the entire offering that DynaSCAPE has (Manage360 for Construction and Maintenance, Design, Color, Sketch3D, Shaderlight Pro). 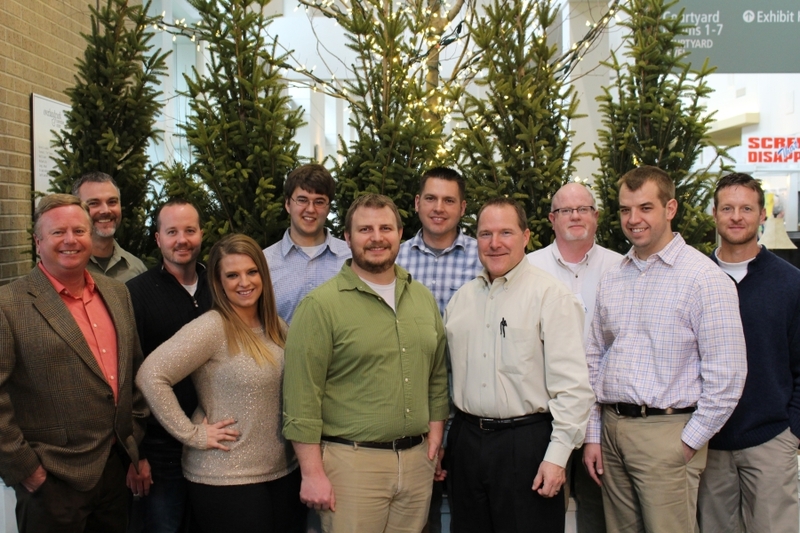 Their large landscape design team spent the winter months committed to learning how to use our design software. They were so happy with the results, they implemented their design service through their website and blogged about it. Check out the Rosehill Gardens blog post! The National Collegiate Landscape Competition was held this past March in Provo, UT at Brigham Young University. Over 750 students from just over 60 colleges and universities from all over the US (and 1 from Canada!) competed in landscape competitions, participated in the largest landscape industry recruiting fair, and had some of the best networking opportunities available. DynaSCAPE is a proud sponsor of the event and thrilled to be part of such a great initiative of the National Association of Landscape Professionals! We have a strong academic program available with DynaSCAPE being taught to thousands of students all over North America. If you know of a college or university with a landscape program that needs DynaSCAPE, let us know! Read more about DynaSCAPE in schools! With the wet spring season started, we thought we would highlight some of the great resources available to you. A comprehensive database of articles that outline how to resolve some known issues within some of the DynaSCAPE applications. All DynaSCAPE clients get a personal page on our website to manage your account. There you can deactivate computers using your DS|Design licenses, access DS|Design and DS|Color training videos, update your credit card information, and access all of your payments. The full manual for DS|Design in PDF format. We really like the PDF format because you can search the entire manual for what you are in looking for. In Adobe Reader, click CTRL + F and type in what you would like to find. Saves a lot of time! We've included some conversion calculators to help you convert between different units of measurement. This FREE 3-part webinar series is going to dive deep into some real ways that you can save time through the course of creating a landscape plan for presentation, quickly and easily creating a plant picture catalog, generating takeoffs, having an internal communication system, setting a way to track sales, creating kits for efficient estimating, creating and tracking change orders, using key reports for decision making, and highlighting the great resources available through DynaSCAPE. Register once and get access to all 3 webinars! Quickly create a plant picture catalog, easily create a construction and layout document using our dimensioning tools, generate an accurate plant and material list to Word or Excel, and maximize your use of the figure library for more productive design work. Utilizing an internal communication system that makes people accountable is key in the busiest time of the year. We'll take a look a integrating your own or developing a new sales process and integrating it into Manage360. We'll see how creating and using Kits can save hours of estimating time. We'll also look at creating and managing Change Orders and how they affect the original contract. Finally, we'll take a look at the essential reports you need to see on a regular basis. DynaSCAPE has many resources available to our community. In this webinar, we'll explore the many resources available and get an inside look at our technical support team. Each webinar will be recorded and posted to the DynaSCAPE website shortly following the live broadcast. As the workload grows some clients feel better about having the ability to install DS|Design and DS|Color on an extra laptop or workstation. Now's the time to add those extra seats you might need. For a limited time we'll take $100 off our additional licenses. To take advantage of this offer, give our sales team a call (1.800.710.1900 x2) or send them an email ( sales@dynascape.com). Offer ends May 31st, 2017. Did you see Landscape Management magazine's "Software Products Guide" in the April 2017 issue? DynaSCAPE was featured in Landscape Management's April 2017 issue in their special feature, "Software Products Guide".